It is a matter of record that our software NetAnalysis (v1.37) was used during the initial examination of this data, and then at a later stage another tool was used. This is, of course, good forensic practice and is often referred to as “dual tool verification”. Within a Mork database, the timestamp information relating to visits are stored as a micro-second count from an epoch of 1st January 1970 at 00:00:00 hours UTC (Universal Coordinated Time). In NetAnalysis v1.37, the forensic examiner had an option to leave the timestamps as they were recorded in the original evidence or to apply a bias to the UTC value to translate it to a local “Standard Time”. In this older version, there was no option to present the timestamp as a local value adjusted for DST (Daylight Saving Time). This changed in NetAnalysis v1.50 when a further date column was introduced which presented the examiner with UTC and local times adjusted for DST. According to video footage of the trial testimony, the forensic examiner wanted the output to reflect local time and not standard time and tried another tool. This second tool was unable to recover any records from the Mork file. The forensic examiner then approached the developer during a training course and discussed the issues he was having with the software. The developer of the second tool then reviewed the Mork database over a period of a few nights and corrected the problem. That software then managed to recover 8,557 records (320 less than NetAnalysis was able to recover at the time). During testimony, the defence picked up on the fact that there were some major differences in the results produced by both tools. The defence assertion was that the initial results produced by NetAnalysis were in fact correct, and that the results from the second tool were flawed. This was discussed at some lengths in the video testimony on 1st July 2011 when the forensic examiner was questioned regarding the differences. This was a major discrepancy with critical digital evidence presented in an extremely serious trial. As the software developer of NetAnalysis, I was extremely anxious to review the raw data and confirm the facts. To demonstrate how this works, and to validate the data, we will walk through a couple of examples. As we have no access to the SYSTEM registry hive from the suspect system, we must assume the computer was correctly set to Eastern Time in 2008 during these visits (time zone verification is always one of the first tasks for the forensic examiner prior to examining any time related evidence). Figure 2 shows a screen shot of NetAnalysis with the data loaded and filtered showing some of the records identified in the testimony from the trial. This evidence contradicts the data recovered by NetAnalysis which showed a single visit at 19:16:34 hours UTC (15:16:34 hours local time). Figure 9 shows a visit to MySpace, which has been verified manually above, and shows 84 visits as of 21st March 2008 at 15:16:13 hours (local time). This is the record highlighted in NetAnalysis in Figure 2. The referrer field is very interesting from a forensic point of view as it shows the referring page. As the HTTP GET is sent to the web server for a page, the browser also sends the referring page as part of the request. This allows web masters to log the route by which visitors land on their pages. Mozilla Firefox records this information for each record. It is therefore relatively easy to track the actions of a user from page to page. In this case, the referring site was a Google search for “how to make chloroform”. With this information (which NetAnalysis shows in the “Referral URL” Column) there really is no need to “guess” how a user arrived at a specific page. With the release of NetAnalysis v1.50 (current version v1.52), the Mork database parser was completely re-written from scratch (as were the other parsing modules). This was primarily to make the code easier to migrate and maintain and to ensure we were recovering as much data as possible. 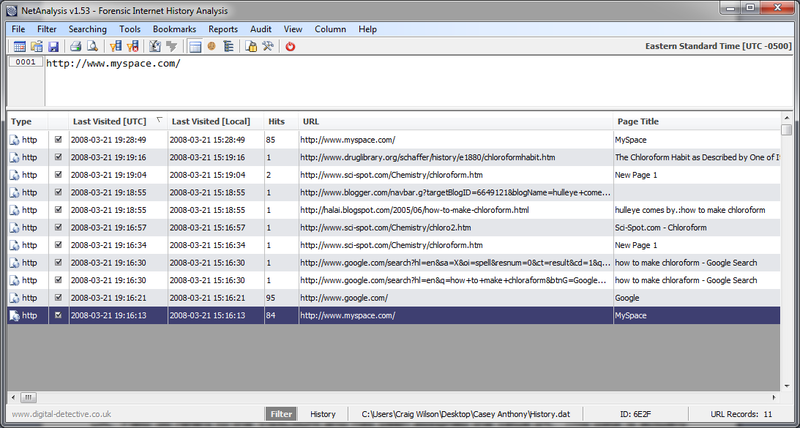 I tested the current release of NetAnalysis v1.52 against the Casey Anthony data. I know from manually examining the data, there are 9,075 individual Index records. Loading the data into NetAnalysis resulted in 9,060 records being recovered. This initially caused me some concern. However, further examination of the data revealed that there was nothing to be concerned about. There were 15 records which had missing “URL” cells; 14 of these records also had missing “LastVisitDate” cells. There are a number of conclusions to be drawn from the digital evidence presented in this trial; however, I will leave this to the members of the digital forensic community. Forensic tool validation is certainly at the forefront of our thoughts. Whilst it may not be possible to validate a tool, it is possible to validate the results against known data sets. If two forensic tools produce completely different results, this should at least warrant further investigation.